So what does my response look like? Original Guinea Pig photograph (it’s so cute!) was uploaded by Marilyn-Ann. Original Bone Pile photograph was uploaded by Keith Putnam. Every step takes us closer, but to where? 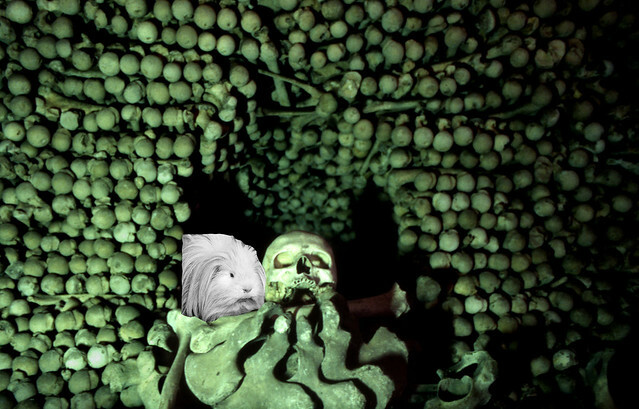 This entry was posted in Daily Create Challenge, New Media_ENGL 866 and tagged Bones_background, Daily Create Challenge, ENGL 866, Flickr, Guinea Pigs, New Media, Photography. Bookmark the permalink. I like that you played with image editing!